Palli Karma-Sahayak Foundation (PKSF) and Development Technical Consultants Pvt. Ltd. (DTCL) have entered in an agreement on August 10, 2015 to conduct the baseline survey of Promoting Agricultural Commercialization and Enterprises (PACE) project, jointly financed by PKSF and International Fund for Agricultural Development (IFAD). Mr. Md. Ziauddin Iqbal, General Manager (Admin. ), PKSF and Dr. M.M. 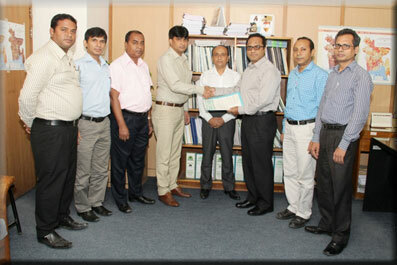 Amir Hossain, Managing Director, DTCL signed the agreement on behalf of their respective organizations. Mr. Akond Md. Rafiqul Islam, General Manager (Operations), PKSF & the Project Coordinator of PACE project was present in the occasion. The consulting firm will complete the study in the next three months. The baseline information relating to socio economic conditions of project participants will be collected under this survey. The findings of the survey will be compared with the findings of mid-term and final outcome surveys to measure the impact of the project.